Ok just to make sure i understand you want an economist who says that tax cuts and deregulation don’t necessarily effect employment growth. Find one that says THIS corporate tax cut and deregulation had no effect in general on all this job creation, and let’s see how credible he is. You’re one of those claiming all this was just a free ride on some magic beans that Obama sowed into the soil. How bout them magic beans. Oh by the way, revenues are down from projections and the deficit is skyrocketing. I asked for the name of a credible economist who said the corporate tax cuts and the huge amount of deregulation was NOT responsible for job creation and you give me this chart again. Yet you still haven’t told me what Obama policy WAS responsible for job creation for his 8 years. You need a new act. Your chart doesn’t tell me what I asked - both times. Ok cool. How about Howard Gleckman. A tax policy writer for Forbes Magazine. Writes on tax policy and elder care. What credentials does he need to have? Yes i did. Stimulus to stop the bleeding. Tax increases on wealthy to close deficits. Auto bailouts. Seemed to work just fine. Better than Trump. It was a response to what you said. Dont forget the HARP program, which helped folks refinance their mortgages even though their home values were underwater due to the great recession. The stimulus was a failure with billions wasted and even Obama admits that it didn’t do what it was supposed to do. And government temporary make-work jobs GO AWAY unless the government keeps infusing cash into more make-work jobs. And frankly, we should never be thrilled to death with taking one tax-payer’s dollar to give it to another tax payer in the form of a temporary job. What Trump did was create the circumstances where business wanted to use THEIR OWN money to expand and create permanent jobs. Obama had no such policies. Tax increases on the wealthy DID NOT create jobs, either. Lastly, bailing out GM was AGAIN using tax payer dollars to help other tax payers. It did NOTHING to make GM create their own jobs and invest their own wealth in permanent jobs and competitive changes, as we have seen. GM didn’t change the systemic problems in their corporation and the result is that they are STILL laying off workers, despite the artificial “help” that we all had to pay for. Obama basically let them coast on our dime. NOT GREAT. What Obama policies got industry and business to CREATE permanent jobs on their own? Show me where Howard Gleckman says that the corporate tax cuts and deregulation didn’t create jobs. Because if he said that he is alone…and stupid, too. He may have his problems with who the tax cuts benefitted, in his opinion, but it absolutely CREATED JOBS, and no one can deny that. Right. 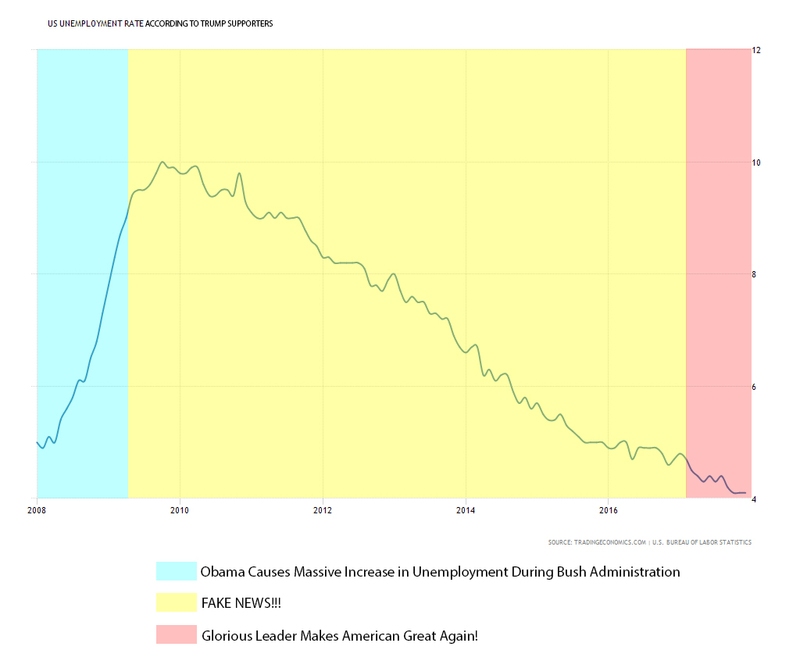 Obama had no stimulative policies at near full employment because he probably wanted to keep the deficit under control at under $500billion since the economy was fine. But MAGA, Yuuuuge, GOP and Trumpists waltz in, do a keg stand, double the deficit with unnecessary tax cuts, raise interest rates due to stimulus of an economy at near full employment, and pretend like they are the ones everyone should be thanking, when people start criticizing the party. Cause, small hands or something. But thanks for the $1trillion deficit at full employment. MAGA. Sure, you forgot an archaic border wall that is being attempted to be constructed by taking already appropriated funds. Look, you guys had full control of the govt for two years and what did you do… increased the deficit. A better question is what have the dems passed since they got the house? Looks like nothing. A lot of the ones being overturned do. overturnign a requirement for O&G operators to report methane leaks. Soon, they’ll be allowed to continue to operate even knowing the leak is occurring. Mines no longer need to provide assurance that they will can and will clean up after the life cycle fo the mine. I suppose that I should say Judicial Appointments, but what I really like is how bat crazy he drives liberals. To me he is like Judge Judy or Rush…I can take his voice upto about 5 minutes before I have to turn him off. That being said, He doesnt drive me near as crazy as he makes you all. And after 8 years of Obama, I really like what he does to you. None of the things you mentioned should be him. They should be congress. Congress makes the laws. Trump doesnt. Congress makes the appropriations to fund enforcement of laws. Trump doesnt.